Amerock BP36603G10 Oberon 1-3/8in(35mm) DIA Knob is finished in Satin Nickel. Inviting to the touch and beautiful to the eye, Oberon is an intriguing take on modern design. Acrylic inserts catch the light in a subtle play against sophisticated finishes. Both the solid cast and acrylic knobs pair well with our sleek bar pulls. The classic Satin Nickel finish provides a sleek, lightly brushed, warm grey metallic look. 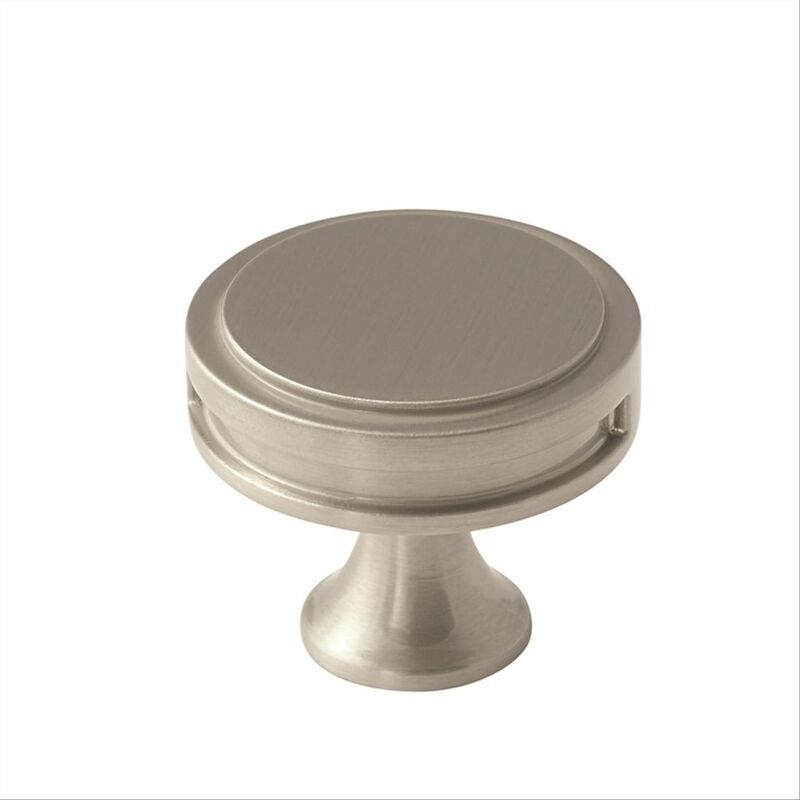 The Amerock BP36582G10 Carolyne 1-1/4in(32mm) LGTH Knob is finished in Satin Nickel. Elegant beading adds visual interest to our Carolyne collection; making each piece exquisite. Bright and polished or strong and subdued - you'll have your pick of gorgeous and stately finishes with this selection of knobs and pulls. The classic Satin Nickel finish provides a sleek, lightly brushed, warm grey metallic look. The Amerock BP36580PN Carolyne 1-3/8in(35mm) DIA Knob is finished in Polished Nickel. Elegant beading adds visual interest to our Carolyne collection; making each piece exquisite. Bright and polished or strong and subdued - you'll have your pick of gorgeous and stately finishes with this selection of knobs and pulls. A modern metallic finish, Polished Nickel offers the beauty and luster of sterling silver without the cost or care it takes to maintain. The Amerock BP36613BBZ Crawford 1-3/8in(35mm) DIA Knob is finished in Golden Champagne. The Crawford collectionbrings together fine lines and smoothtransitions to create accents with unforgettable style that never fades into the background. Golden Champagne: raise a toast to this rich metallic finish. Warm and inviting without being brassy, this attractive hue elevates designs with enviable versatility. The Amerock BP36601G10 Davenport 1-1/4in(32mm) LGTH Knob is finished in Satin Nickel. Simple lines and curves paired with strong, subtle finishes give the Davenport collection a distinct appeal. Installed horizontally or vertically, the balanced lines of these cast metal knobs and pulls add refined geometry to any space. The classic Satin Nickel finish provides a sleek, lightly brushed, warm grey metallic look. Oberon 1-3/8 Inch (35mm) DIA Knob - Satin Nickel Amerock BP36603G10 Oberon 1-3/8in(35mm) DIA Knob is finished in Satin Nickel. Inviting to the touch and beautiful to the eye, Oberon is an intriguing take on modern design. Acrylic inserts catch the light in a subtle play against sophisticated finishes. Both the solid cast and acrylic knobs pair well with our sleek bar pulls. The classic Satin Nickel finish provides a sleek, lightly brushed, warm grey metallic look. Oberon 1-3/8 Inch (35mm) DIA Knob - Satin Nickel is rated 5.0 out of 5 by 1. Rated 5 out of 5 by Robert from Made the cabinets look complete. ... Made the cabinets look complete.